40k 8th Edition is showing itself to be fairly well balanced. However, many Xenos factions have a tiny range of options when compared to the grand soups of Imperium, Aeldari and Chaos. Our army composition rules level the playing field, allowing all factions the chance to succeed and removing much of the min-maxing that scares people away from the tournament scene. Also, Sportsmanship is part of your overall score, eliminating slow play and poor generalship. 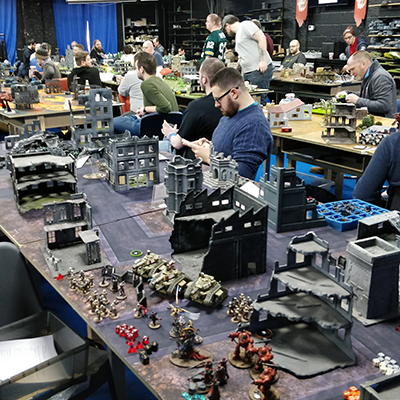 In the very competitive tournaments, well painted armies are a "nice to have" and it's common to see armies which have clearly been hastily done in order to make the minimum requirements. At Death Before Dishonour our standards are higher. The top prizes include an element of painting scores, and our reward those who excel at all parts of the hobby - gaming, painting and sportsmanship. 40k is better with good terrain, which not only functions well by giving cover and blocking LOS but also looks great. Our venue Element Games has enough Fat Mats and terrain to run more than 50 tables, so by limiting our tournament to just 64 players on 32 tables, we ensure your play area only uses their best pieces, to be attractive and give a fair and fun gaming space. Planet bowling ball this is not.